Aryanna Berringer grew up the youngest of 10 children in a family that had to rely on food stamps and free school lunches to get by. She remembers how her mother would wash the three different uniforms for her jobs at three different restaurants in their kitchen sink. All of this motivated Berringer to run for lieutenant governor of Pennsylvania, because she wanted to be a voice for minorities and people who grew up in poverty. Berringer was one of six panelists at an event hosted by Students United for Policy Change in room 2017 of the Cathedral of Learning Sunday night. Olivia Benson, Michelle Boyle, Marita Garrett, Sara Innamorato and Megan Winters joined her in discussing their experiences as women involved in politics in front of 27 attendees. Garrett, the current mayor of Wilkinsburg, mentioned that Pennsylvania is ranked 49th in female representation in elected offices — just one spot above Mississippi. This ranking is confirmed by Represent Women’s gender parity index, which also notes that there are no Pennsylvania women in the U.S. Congress and no woman has ever served the state’s governor. Benson, the community engagement director at the Women and Girls Foundations — a group that raises awareness of social inequality in the media and in politics — said she is passionate about supporting women’s and girls’ efforts to become more politically involved. “I get really frustrated by the fact that there is a lack of women, specifically a lack of women of color being elected in office,” she said. Berringer said it is important to have women in office because that inspires other women to run and create change in their communities. She described how not seeing people who look like you in leadership positions can affect your confidence to affect change yourself. “The lack of representation … makes you wonder if you could actually do it yourself, and I feel fortunate that there are a number at the national level who have run for office,” she said. After 24 years of experience as a nurse, Boyle said she became more involved in politics ever since she witnessed inequities in the health care system. Now, she is running for Pennsylvania Senate in District 38 with the goal of addressing issues for people who do not have health insurance. Innamorato, who is currently running for the Pennsylvania House of Representatives seat in District 21, said she always wanted to stay out of elected office and work in community development, but was encouraged to run. “I recognized there was such a dearth of women in elected office, because these women who have run and won still face misogyny and pushback,” Innamorato said. The event ended with an invitation for the audience to ask any questions they had for the panelists. One audience member expressed a concern with the state government, citing it as pursuing policies that limit a women’s abortion access, and wanted to know about the panelists’ positions regarding the issue. Berringer replied, saying that having someone in office who can better relate to the issues about women’s health care is important. “I think you need someone who has got the real life experience of why this is important and has the guts to say it,” she said. 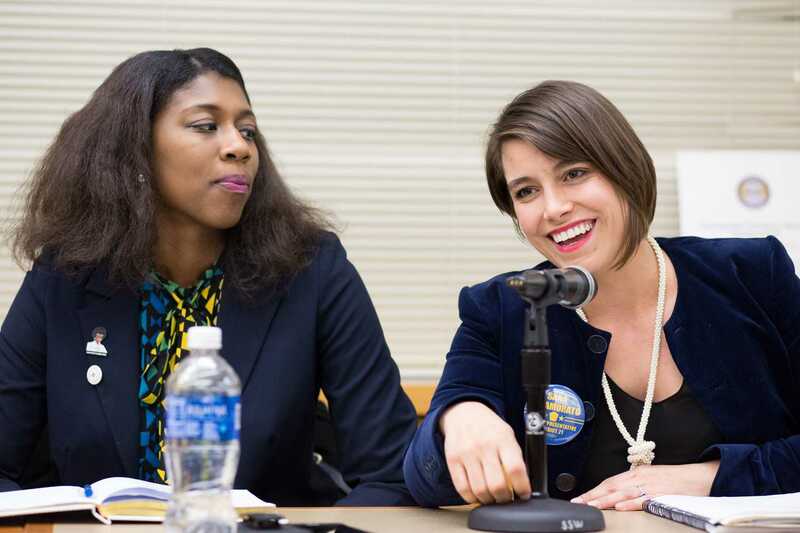 Winters, who is the data and Western region director of the Pennsylvania Democratic Party and a board member of Emerge Pennsylvania, said she wants to empower progressive women at the local and state level of government to run. She also spoke about getting more people, especially women, to vote during elections in order to better their communities. “We’re in a room full of students, and I’m only a few years out of being a student, but I always felt that my peers weren’t voting at the rate we should be, and we should make sure that our votes count by voting for people who agree with your position on certain issues,” she said. Senior political science major Aarti Chandan said she enjoyed hearing about the panelists’ experiences as female politicians in person. “I think it’s really cool that we get to see [women in politics] in person and hear their firsthand accounts and their stories about the struggle for women to break through in politics,” Chandan said. JoAnna Clark, a senior studying media and professional communications, also enjoyed the panel discussion because it related to what she is learning in her classes.